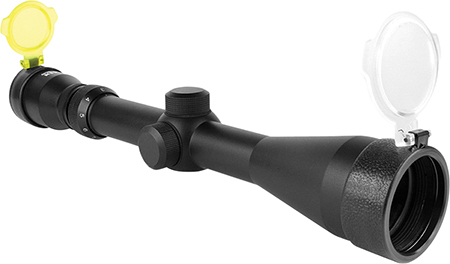 This fullsize scope has 39x magnification with a 40mm objective. Iit is milled from one solid piece of aircraftgrade aluminum to withstand constant heavy recoil and is fogproof shockresistant housing with nitrogenfilled weatherresistant seals. It is windage and elevation adjustable. The green fused multicoated lens provides superior light and flipup lens covers protect from dust and scratches when not in use.